Forgotten Lessons for Journalism’s Future. Communication Currents, December, 2010. Victor Pickard, Dear FCC: Net Neutrality Is Part of a Social Contract, Huffington Post, April 17, 2013. Victor Pickard, A Fighter for the Public Interest at the FCC, Huffington Post, April 17, 2013. 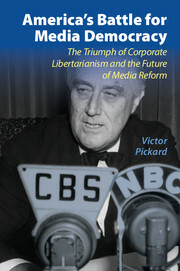 Interview: The FCC, the Public Interest and the Blue Book, Bill Moyers, December 19, 2012. Victor Pickard, Finding journalism’s future, The Philadelphia Inquirer, April 11, 2012. Victor Pickard, A Final Farewell to the Fairness Doctrine?, History News Network, October 20, 2011. Cracks in the Pay Walls. SavetheNews.net, August 24, 2009. Take the Profit Motive out of News. Guardian UK, July 23, 2009. Costs of the Journalism Crisis. SavetheNews.net, July 22, 2009. Saving America’s Democracy- sustaining Journalism. Seattle Times, July 5, 2009. Confronting the Crisis in Journalism. Smart Assets: The Philanthropy New York Blog, June 12, 2009. Internet for All: Competition, Consumer Choice, and the Cost of Connectivity. InternetforEveryone.net, December 5, 2009.